"Louise is not your ordinary chicken; longing for adventure, she travels across seas, participates in a circus, and has her fortune told. Barbara Rosenblat's commanding narration brings Louise's daring nature fully to light. Drawing out the drama of the hen's close call with pirates, her narrow escape from the jaws of a lion, and a daring jailbreak, Rosenblat inflates Louise's small story to maximum advantage, much to the delight of listeners. Highlighting DiCamillo's wordplay and alliteration ("the pleasures and perils she met proved plentiful"), Rosenblat creates an unlikely but likable (and quite unflappable) heroine who remains unruffled even in the face of great danger. Great illustrations by Harry Bliss in the read-along version add to listeners' enjoyment." "Louise longs for adventure beyond her chicken-coop home, and each of her forays into the larger world brings more danger than she expects. Taking a high-seas trip ends in capture by pirates and a shipwreck, joining the zoo leads to a near miss with an escaped lion, and visiting a fortune-teller at an exotic bazaar foretells an encounter with a scary hen-napper. Finally, Louise settles for becoming the barnyard storyteller, sharing adventures with her stay-at-home companions. 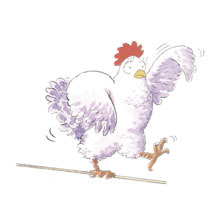 Rosenblat's robust interpretation of the intrepid chicken's wanderings is a virtuoso performance. Nimbly switching back and forth from Louise and her French-accented friend Monique to the individually voiced band of pirates, a circus ringmaster, and the silken-voiced fortune-teller, Rosenblat imbues each character Louise meets with a unique flavor. Original background music, crowd noises, and softly clucking hens add to the ambience of this excellent read-along, which is a crowd-pleaser." Starred Review-"Pirates! Shipwrecks! Lion attacks! Chicken-napping! Louise is a chicken with a yen for adventure. She slips away from the humdrum world of the farm and sets out to sea, only to be captured by pirates and nearly fricasseed. Home sounds good, but adventure calls again as she joins the circus and does a daring high-wire act that ends with her nearly becoming a lion's lunch. Again the farm seems a safe retreat, but when you have drumsticks itching for adventure you know you'll be off again. This time our saucy French hen follows in the footsteps of classic adventurers such as Indiana Jones, visits a fortune-teller, is captured by a tall dark stranger, and frees fellow chickens so that they, too, can cluck free! When she returns home, she tells the other chickens of her adventures and they are appropriately impressed and horrified. Home is a welcome, safe, refuge-but can Louise really settle down there? This delightful feathered frolic by Kate DiCamillo (HarperCollins/Joanna Cotler Books, 2008) is masterfully performed by Barbara Rosenblat who reads the story with fine pacing and energy and creates unique personalities, voices, and accents for each character. Light background music and sound effects make this a treat for the ears as well as the imagination. As students enjoy the vocal presentation, they can also peruse Harry Bliss's hilarious illustrations, filled with quirky details (some of which only adults will catch). This fine feathered feast for eyes and ears will be enjoyed by those with a thirst for adventure."